I did do quite a bit of birding over the last week, heading out for most of one evening, and then spending much of Saturday birding. Birding was pretty good...not many warblers yet, but a good mix (Blackburnian being the highlight), plus a very large flock of American Golden Plovers, a species I don't see all that often. Good week for birding, bad week for photos. 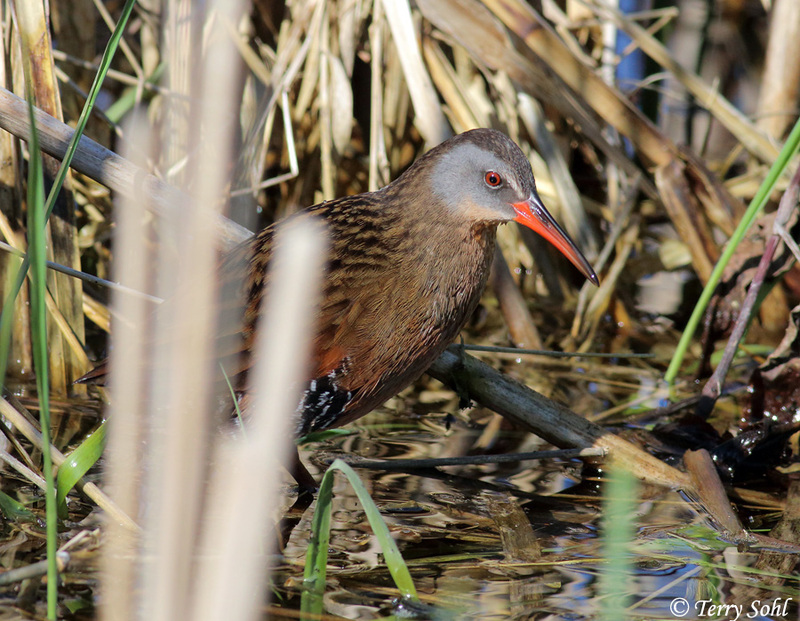 The photo of the week is thus a photo taken last weekend, a Virginia Rail. These guys are heard a lot when you are around cattails and wetlands, but seen much less frequently. However, when they're around, I've found that if you're patient you can usually get a glimpse. In this case, it was a wetland in Lincoln County with a gravel road running through it. I heard Virginia Rail and Sora both calling, so I pulled over, rolled down the window, and waited. Got glimpses of both species, but it was this Virginia Rail that briefly gave me a little window through the vegetation to get a nice photo.